How long before I see bloom? When should I see full bloom? 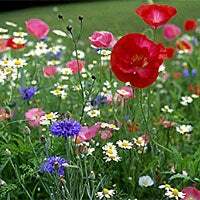 What if I planted only perennial wildflowers? How can I identify the different wildflower seedlings? Can I gather seed from my meadow? How can I keep my flowers blooming? What about cutting flowers for arrangements? Any tips for making Wildflower Arrangements? Can I plant more seed during summer? How do I plan for next year? Summer is here, and we hope you're enjoying your wildflowers. If you're new to wildflower meadow gardening, you may be wondering what to expect from your wildflower meadow. Here are answers to some frequently asked questions. If you planted a mixture with wild annuals in it (That's all regional mixtures, All-Annual, Butterfly/Hummingbird, etc. ), your bloom should begin between 6-12 weeks after the seed sprouts. For example, in the Northeast, if you plant in late May, bloom begins during June or July. Of course, this assumes two important factors: weather and water. If you're in the "hot zone" this year, things may be slowed down a bit. And of course, your seedlings must have sufficient water to grow up to blooming size. In most mixtures, the wildflowers you see first will include wild baby's breath, and maybe the tiny little "baby blue eyes". These and a few others bloom quickly and while the whole planting is short. As time goes by, you'll note they disappear under taller growers with later blooms. When should I see "full bloom"? If you planted our All-Perennial Mix or only perennial species, chances are you won't see bloom this summer. Instead, these plants, which "come back" year after year, make heavy root growth their first year, and very little top growth. A daisy, for example, will create only a few little glossy green leaves on a 3-inch plant during its first summer. The next year, and for years after that, where you had that little plant the first summer, you'll have a large 24" high clump with big leaves and tall, sturdy flowers. What's more, the clump grows larger and more prolific with passing seasons. As our website explains, perennial seed planters are the ones who are willing to invest a growing season without bloom to end up with a field of permanent, blooming perennials. There are exceptions to this, but if most of your planting is perennials, the big show will be next summer. Every meadow gardener grapples with this question. Unlike vegetable gardens and traditional flower gardens where every weed is removed as it appears, weeding in a meadow garden is different. Many wildflower gardeners allow volunteer grasses and weeds to grow right along with the wildflowers they've planted. But as any gardener knows, this can get out of hand. If you see weeds that are easy to remove, just pull them. Your wildflowers will quickly fill in the spaces as they grow. Later in the season, when you notice some tall, healthy weeds or grasses among your wildflowers, try not to let them bloom and seed. This means when they "top out" with seed heads on the plants (wheat-like seed plumes or tassels for most grasses) either pull the plants or cut the tops before the seed ripens. This way, those seeds won't rain down into your flowers and be back next year in bigger numbers. or Gloriosa Daisy Rudbeckia sp. Many people ask this, and of course, the answer is "Yes, definitely!" In fact, you can watch your flowers, and gather the seed of just your favorite blooms. Red poppies, for example, have an endless number of flower variations. If you have the "mixed colors", you'll see the pure reds, pinks, whites, even doubles and bi-colors among your poppies. If you particularly like one form, save the seed from the little pod that's left after the flower fades (leave it on the plant until it's good and dry), store the seed in a dry envelope until next spring, and you'll have more of the exact same flowers. The same is true of multicolored cornflowers, cosmos and coreopsis. You can choose your favorite flower types and save the seed for more of the same. Saved seed like this makes great gifts for your gardening friends! One important consideration is water. If things dry out for long periods, bloom will be reduced, and with real drought, bloom can actually shut down. Most wildflowers won't die, they'll simply "wait for the water" and not bloom. So if it's very dry, water when you can, even when your meadow is up and blooming. As expert flower gardeners know, if you cut annual flowers, it forces more bloom. Here's why. Since an annual lives only one year, it's "purpose in life" is to create seed. If you remove flowers before the ripen into seed pods, the plant simply buds out and makes more flowers, trying to produce some seed. This really works with some of the wild annuals. Of course, if you have a whole acre blooming, there's not much hand work you can do! But many meadow gardeners do preen a small area, or an area that's near the house, etc. If you keep your red poppies "deadheaded"-that means chopping off the flowers as they fade and before the center of the flower becomes the seed pod-their natural blooming period can actually be doubled. How to do it? The easy way is with scissors. Poppies have stiff thin stems, and you can snip a lot quickly with a pair of scissors. The same is true of cornflowers and coreopsis, both of which make great cut flowers. This is one of the great joys of wildflower gardening. Unlike traditional flower gardens, where the removal of prized blooms ruins the "look" of the garden, wildflowers are so prolific, the ones cut will never be missed. Red poppies, unfortunately, do not make great cutflowers, since they drop their delicate petals about 12-14 hrs. after cutting. This doesn't stop many gardeners, since they want to take some of the stunning flowers inside. Here's how to handle them: Cut only the freshest, newest flowers; cut some which are just barely opening. Then once you have them inside, light a match and hold it to the base of the cut stem and "fuse" it. This means not just heating it... burn each one black before you put it into the vase. This tends to seal the cut stem which has a milky juice inside, and it prolongs the flower's vase life by at least a day. The champion cut flowers in our wildflower mixtures include baby's breath, cornflowers, cosmos, plains coreopsis, farewell-to-spring, and rose mallow among the annuals. Perennial favorites for cutting are, of course, daisies, black-eyed susans, purple coneflowers, lupine, and lanceleaf coreopsis. A note about cosmos: They make such great cut flowers, most growers cut full branches from the big plants, and make spectacular flower arrangements. Don't worry-the plants will replace the "branches" you take off in practically no time. Yes. After years of growing wildflowers, we've found many people enjoy big multi-colored arrangements that can really light up a room. With such a wealth of material to choose from, be sure to get our your biggest vase before you start. Try to cut either early in the day or at dusk-when things aren't too hot, and choose the freshest flowers. Go out into the meadow with a bucket or can half filled with water. As you cut the stems, pop them immediately into your water bucket. This is really worth the trouble; your flowers will last up to twice as long. Another tip is to be creative with what you put in your arrangement. We like long grass plumes, the tassles from grasses (and even some weeds) that are setting seeds. A few of these "wheat-like" spikes towering above a big flower arrangement give it a decided "wild" look, a great unique representation of the wild meadow outside. Can I plant more seed during summer? How about fall? In most areas, yes. Summer is a perfectly good planting time. After all, nature plants wildflower seed all summer long, as flowers in the wild bloom, fade, dry out, and finally drop their seeds to the ground. 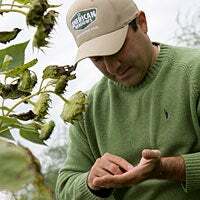 But heat and drying out make things more difficult for seed than the perfect cool, moist conditions of spring. And that's your tip. If you plant during the summer, you'll have to water more, and if it's very hot, the seed may take awhile to sprout. Sooner or later…in the cooler days of fall if all else fails, the seed will probably begin its growth, assuming it has good contact with the soil. Now's the time! Look carefully and often. Take notes. Take pictures. Every meadow gardener enjoys the show but is secretly thinking, "Wait'll next year! ", and that's one of wildflower gardening's great joys. Visions of bird-feeders, grassy paths through the flowers, a decorative bench in a favorite spot-maybe even a pond, are always dancing in our heads. With wildflowers, they'll all relatively easy. So record and remember your favorites, stake out not-so-great areas to refresh next time, and enjoy! "Next Time", whether you planted last spring or last fall, is this coming fall. Remember, nature plants most wildflowers in the fall, and so can you. It's not too early to be choosing which species or mixtures you'd like to add to improve or expand things. You can plant perennial seed anytime, all summer long. In fact, perennial seed planted anytime up until about September, will "think" it's been in the ground a full year, and be ready to bloom for you next spring. As mentioned above, save your annual species seed to plant after killing frost in your area.